Today, after the 10:00 AM service, we will gather in the undercroft for our Annual Parish Meeting. A part of the governance structure of the Episcopal Church, the Annual Parish Meeting is our chance to gather together as a corporate body (I know, that is redundant) to do the ‘business’ of the parish. That business is to receive the financial report of the year past, approve the budget for the year to come, receive reports of committees and organizations, and to elect representatives from within the parish to represent the parishioners for the business decisions of the parish between Annual Parish Meetings, known as the vestry. After the American Revolution, what was left of the Church of England in the new United States had to organize and develop a governance structure unique to that of England and Scotland. There, the king, who was the supreme governor of the church, appointed bishops who ruled their dioceses with varying degrees of input from priests and parishes. That model could not work here in this new country, without a king and suspicious of top-down autocratic leadership style. After the hard work of the Constitutional Convention to form a system of government with checks and balances, many people who worked on that system were also integral to the forming of a governance system for this new Episcopal Church. It has a House of Bishops and a House of Deputies (clergy and laity elected by their dioceses), with a Presiding Bishop, and a President of the House of Deputies with executive powers. The Executive Council governs between triennial gatherings. At the diocesan level, we have a yearly convention to elect leaders and pass budgets, and occasionally even elect a bishop. All clergy are represented, as well as every parish by laity elected by their vestry. This system works if we keep in mind that it is our Lord’s mission we are called to accomplish, by His Grace! We vote to do His Will, not always our own. Yesterday I led the burial office at a funeral home in Fenton for my wife’s aunt. She wasn’t a parishioner, but I was happy to be of help to the family as they gathered together to mourn Sally’s death, celebrate her life, and to thank God that she has ‘gone home’ to her heavenly Father. We also were comforted at the thought that she was with Arnie whom she yearned to see, her beloved husband, who died 10 years earlier after a long struggle with Alzheimer’s disease. The Burial Office is a gem of the Book of Common Prayer. Although it is preferable to have a Requiem Mass at the Church, the Burial Office, with its cadence of psalms, readings and prayers, speaks of the hope of the Resurrection and the doctrine of the Church in a beautiful form for ‘common’ use. And as happens at all burials, whether at St. John’s or at a funeral home, I hear again and again a litany of praise for the beauty of the service and its power to speak of hope and comfort. Episcopalian is that it is all in the Prayer Book, and if we believe what we are saying it comes through by grace. Next month I complete my 16th year as the rector of St. John’s. I continue to thank God for bringing me here and blessing me to continue in this portion of His vineyard. I never could have imagined what life would be like over these many years here, its ups and down. But I am grateful to have gone through these years with you and ministering to you. Life is full of changes. We age, marry, give birth, and die. Buildings come down and buildings go up or are renovated. And peoples’ attitudes change as well. Some change is most welcome and for good, and other change is damaging and should be avoided. We know physical change around St. John’s! The M1 Rail and new parking structure will be operational (we are told) by April. Construction begins in the spring on our drop off area behind the office, and the narthex garden entrance will be re-graded and made handicapped accessible. And, God willing, by summer or fall we will begin the changes to the undercroft, the kitchen, and the office building. Physical change is all around. And as the changes to the neighborhood continue, we as a parish continue to evaluate needed changes and ministry opportunities. 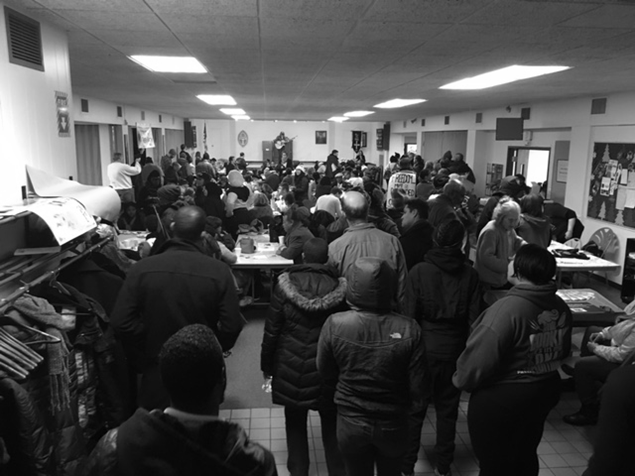 Already we have not only begun to expand our reach to local ministries through the work of the Outreach Committee, but continue to open our doors to various neighborhood groups to use our building to build community and respond to needs. These are exciting changes. And we also are working to develop programing to appeal to both our current parishioners as well as those who are moving into the neighborhood. And in the next months we will be hopefully adding staffing, thoroughly Anglican, to respond to these opportunities as well as create them. But as I began this musing, even though many things change, there is a wonderful changelessness to the faith, and especially as it has been codified and entrusted to us as Anglicans. It is a changelessness that is grounded in Scripture, and one which has survived 158 years of change to our neighborhood, at one time known as Piety Hill. Please note that of the 7 houses of worship that made up this neighborhood only St. John’s and Central Methodist remain as churches. As the Jews moved from the neighborhood the Synagogue became a series of churches and eventually became the Bonstelle theatre. The Unitarians merged with the Universalists at Wayne State and the building used by a series of local churches until it was abandoned and burned a few years ago. The Presbyterians tried adapting to the changes in the neighborhood and closed shop long ago, the building is now an ecumenical seminary. The Baptist church across from the freeway became local and then abandoned and eventual burned. The original Roman Cathedral was in Brush Park and was sold to the city and eventually burned. As I have researched these former churches, I read of the times where they were told to ‘change, change, change’ to adopt to the culture, but they did so to their faith and heritage, and now the buildings are no longer houses of worship. St. John’s persevered in the faith and worship of the historic church, and she not only survives but attendance continues to be more than four times the size it was in the 1990s, and is now poised for explosive growth as upwards of 4000 new housing units are slated to be built in the next 5 to 10 years. And by standing firm and faithful, once again we are seeing a new generation yearning for that which is eternal and meaningful – traditional Anglicanism at its core. We as members are called to continue to worship, to continue to learn, and continue to reach out and look for ways to being more and more people into the practice of the faith with us here at St. John’s. The faith won’t change, and the worship won’t change. But how we reach others, incorporate them into our fellowship, and witness to the neighborhood and the world will be our challenge in the coming year. Remember, the good thing about being Episcopalians (Traditional Anglicans) is that it is all in the Prayer Book, and if we believe what we are saying (and praying) it comes through by grace. I look forward, God willing, to a wonderful 17th year together. Last year was a pretty exciting, if somewhat turbulent year. We saw some big changes in the choir. First, we lost three members: Soprano Giles Simmer took a maternity leave, and subsequently decided to make that leave permanent. We were very lucky to be able to get Hannah Sparrow to fill in for Giles on a temporary basis. And we were thrilled that she then accepted the ‘permanent’ position. Alto Brittany Ward was offered a job in New York at the beginning of the summer. This left us in a tricky situation because we were down to two. And I learned about this after the roster of summer quartets was in place. The situation got even more dire with illness, but we managed to make it through the summer without any though things got very near the knuckle. On one occasion, a substitute was finally obtained in the very early hours of Sunday morning! Lastly, Catharine Langmuir decided it was time to step down. She had been thinking about this for several years because of family ties and commitments. Ever since she rejoined the choir, Catharine had taken care care of the choir library, sang in the choir, and hosted choir parties at her home. We all miss her very much indeed. But we are happy to see her on those rare occasions when her schedule allows her to be with us in Church. The most exciting thing about last year was restoration of the choir budget. This allowed me to go back to having 16 singers – four in each section. This gives us several advantages: First it means we have a richer and fuller sound. Second it means that we can do certain pieces that require many different parts. And third, it means that on those occasions when the inevitable last minute illness strikes, our work is not too compromised. The new singers I hired are found in the alto, tenor and bass sections; alto Helen Haas and tenor Shohei Kobayashi are both graduate students at The University of Michigan; and alto Mysti Burns and bass Jeff Burns sing at Michigan Opera Theatre. They also happen to be married. I thought we had many memorable moments last year: notably though would have to be the extraordinary singing of Adrian Leskiw and Constantine Novotny in Stainer’s Crucifixion on Good Friday. It was something of a miracle that it came off, because Adrian was actually going through a ruptured appendix which finally made its presence fully felt on Easter Saturday. As you may recall, he was gone until the summer. I also thought the music at the Corpus Christi Mass was particularly memorable. I’m happy to report that the choir’s fine work is recognized beyond the four walls of St. John’s. Last week we were invited to be the Choir for a Great Festive Service next September. The service will take place in the glorious acoustics of the Basilica of St. Adalbert in Grand Rapids. It will be a joint program for five different Chapters of the American Guild of Organists, and will mark the beginning of their various seasons. The preacher will the National Chaplain of the Guild. I can’t let the year pass without expressing again my thanks to Chris Sayers for his help behind the scenes in running the program. Chris is invaluable in finding new and substitute singers. And I hope none of us takes for granted the lovely commentaries on music that appear every Sunday, or the rather spectacular special service booklets for Easter and Christmas for which Chris generously donates countless hours of his time. The big ‘future event’ this year will be saying goodbye to David Heinze, our fifth John Leigh Edwards Organ Scholar. David has been with us for almost two years. In May, he graduates from Hope, and will begin graduate studies in the Fall. David’s in the rather envious position of having to choose between lots of options. Where to go? Which offer to accept? David turned down Yale’s invitation to audition there… So now it’s down to deciding whether it’ll be the Royal College of Music in London, where he’s been accepted and offered a scholarship; or whether it’ll be The Royal academy of Music, in London, where he’s also been accepted, and also offered a scholarship. Or whether it’ll be Cambridge University, where he’s been unofficially accepted and offered the graduate Organ Scholarship at Selwyn College. Wherever he chooses to go, we’ll all miss David very much. He has greatly enhanced our worship with his fine playing, and enriched our community with his kind and thoughtful ways. As you might imagine, no one will miss him more than I will, and not just because of the sandwiches that he makes to eat on our weekly trips across the wilds of Michigan. And lastly, of course, I want to express my heartfelt thanks to our Rector, the Vestry, and you the people of St. John’s who continue to bless me personally with your singing and your prayers. This week we are in the midst of the Week of Prayer for Christian Unity. It started on January 18 and ends on Wednesday, January 25. Couched between the Feasts of the Confession of St. Peter and the Conversion of St. Paul, we have been praying with special intention for the Unity of the Church, that we all may be one as Jesus and the Father are one (John 17:21, 22.) There is information on the history of this special week in the St. John’s Teaching Notes on page 4. 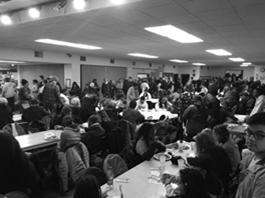 This past week we also had a wonderful opportunity to work with the community by hosting a Martin Luther King Jr. Day Community Meal, with poetry readings and local musicians performing. It was a packed house, and many came upstairs for tours of the church and asked questions. May God grant us many other opportunities to minister in our neighborhood. Most people have their only contact with St. John’s on Sunday morning, and we are grateful for your attendance at worship (which is your bounden duty). But we also can be quite busy here during the week as well. In addition to the weekday Masses, six Alcoholics Anonymous meetings, and our Thursday night Bible Study session that happen here regularly, we host a variety of groups, from the 13th District Republicans to the M-1 Rail Community Info. meetings. We also have various Alternative Spring Break programs from colleges across the country who spend a week here in our building; using it for sleeping, eating, and lectures in between their community work outside the building. This Monday, and Monday two weeks from now, the Church celebrates two related saints, Archbishop William Laud and King Charles I. They are related in that William Laud was Archbishop under King Charles, and both died in the same turbulent time England, and for the same religious truth – that the Church of England is the Catholic Church in England (neither Roman nor Calvinist). The first century of the Reformation in England was turbulent for the Church. Henry VIII made comparably few changes to the worship and theology of the Church compared to what was to come. Most liturgy continued in Latin (the first English Book of Common Prayer would be published two years after Henry’s death). The major change coming in that Church authority was transferred from Rome to the English throne. With Henry’s death his nine-year-old son took the throne and his Regents included the more Protestant bishops who installed the Protestant reforms of English Liturgy, clerical marriage, and reformed theology. Edward’s death at 15 saw his half-sister Mary restore the English Church to Roman Catholicism for her five-year reign. Then her half-sister, Elizabeth, ascended to the throne, and during her nearly 45-year reign restored the Church of England’s independence from Rome and the use of the Book of Common Prayer, but confounded the more Protestant-minded by keeping the Catholic apostolic order for ministry and the sacraments. The Elizabethan Settlement, trying to be both Protestant and Catholic, made for an uneasy peace through the subsequent reign of King James I (as in the Bible translation we use), which then erupted under Charles I.
Protestant pressures on the official English Church came to a head under Charles I. Their disagreement over the King’s marriage to a Roman Catholic, combined with the King and Archbishop Laud’s insistence on the use of the ancient English Faith and Ritual, put them at odds with an increasingly Protestant (English Puritan and Scottish Presbyterian) Parliament, led by Oliver Cromwell. Archbishop William Laud was beheaded by Parliament for treason in 1645, and Charles I in 1649. It would take England 11 years to restore the monarchy to Charles II. In doing, so it affirmed the true nature of the Church of God was not Calvinist or Presbyterian, but “One, Holy, Catholic, and Apostolic”. The 1662 Book of Common Prayer, the fruit of that restoration, continues as England’s official Book of Common Prayer to this day. It feels like the new year is really beginning today because last Sunday was New Years Day, and attendance was affected by travel and late night adventures bringing in the new calendar year. I hope that now we are well into our resolutions of the new year, and are actually sticking to a few of them! Each new year brings a new hope, and we usually use that change to steel up our resolve to do better at one thing or another. “This will be the year that I _________” we tell ourselves, and we say so with the best of intentions. But for most folks that intention is forgotten or disregarded pretty soon thereafter, sometimes within days. It is hoped that of all the hopes wrapped up in these promises to self that some of them will stick, and positive permanent change will happen. Sometimes, it is the failure of a resolution that is actually helpful. Nearly 28 years ago I made a new years resolution to not drink for a month. I failed, twice, in two weeks. But it was that failure that forced me to face my problem with alcohol, that I was powerless over it, and that it was making my life unmanageable. From this bottom point I was willing to get help, and began getting it from friends who had a set of steps to help me cooperate with God in staying away from alcohol and being freed from the obsession to drink. Whether our resolution this year is for something that is just a bad habit, or something self-destructive of which we want to rid ourselves, Our Lord is there to help. How often do we decide to take on a really hard thing, and forget that Our Lord is concerned for our physical/emotional/spiritual welfare and that he will provide the Grace necessary to accomplish it (or if we fail, to repent and begin again). This year let’s start some habits! Start good habits like regular Church attendance, regular prayer and reading of Scripture, and going to Him first (not last), in order to stay on track, or get back on when necessary. Today we start the year off right by attending Church, especially because the feast day also falls on a Sunday. A very small percentage of regular Church-goers attend worship on New Year’s day. Most people stayed up too late to ring in the New Year, and perhaps enjoyed one or two libations which hindered their early rising. And there are many distractions on New Year’s Day, including parades from California and Miami, and a barrage of college football games. In Philadelphia there was the Mummer’s Parade, an all day and evening affair of men dressed in strange feathered costumes and marching to music on saxophone and banjo (I kid you not…try Googling “Mummers Parade”). Today is a feast day, not because it is the start of the calendar year, but because it is the 8th day of Christmas. Having celebrated with great pomp and ceremony the birth of Jesus on Christmas, the Church gathers again 7 days later as Jesus participates in the original covenant between God and the people of the Jews by being circumcised. This outward sign of the covenant, sealed with the shedding of blood, was the proof of being one of God’s people. Jesus was a Jew, but this shedding of first blood was also the beginning of the fulfillment of the old Law by Jesus, so that we are marked not in the flesh but saved by grace through faith.